There are pros and cons to both embroidery & screen printing. Embroidered items can cost a little more, but their perceived value is much higher. The imprint will also last a lot longer since the embroidery won’t fade away with the passing of years and tons of washes. You should also consider the fact that an embroidered logo literally stands out from your item. Screen printing sets a very fine layer of ink to your product; embroidery has more mass to it so it will rest slightly higher than your item. Also the majority of embroidered items allow you to have multiple colors without having to pay extra. The allowance of extra colors makes embroidery ideal for schools and organizations who have a multi-color logo and don’t want to simplify their color palate. You’re in luck! 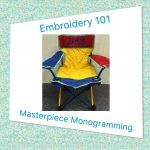 While most promotional products distributors like Masterpiece Monogramming generally need vector artwork to process your order, this is not the case with embroidery. While we strongly encourage using vector artwork, any high-quality image file will work. This is because all of the images are digitized and then programmed into the embroidery machine. If you do chose to use raster artwork (.jpeg, .gif, etc. ), make sure the image is a little bigger than the area you’re going to have embroidered. The clearer the image, the better quality of embroidery. Unsure if your image is good enough? Then using vectored artwork will ensure that your logo looks clear and crisp on your final product. Different factories have different policies and fees for digitizing artwork. Masterpiece Monogramming also has their own artwork services that can digitize your logo or design. Depending on the garment you want embroidered, Kathy, Janelle or Ashli will work with you to make sure that you get the best bang for your buck. Stitch count is how many stitches it will take to replicate your logo or design on your item. Surprisingly, it takes a lot of stitches to recreate a logo on a garment. The included stitches are determined by the factory. It is always possible to get more stitches on your garments if your logo needs them. Just keep in mind that the more stitches required to finish a garment (over the amount included in your base price), the more expensive your item will be. Masterpiece Monogramming has a very large selection of colors to choose from. Of course – as long as there is an option for that. Some products may only allow embroidery in one location. The Masterpiece Monogramming customer service highly recommends using a simple logo. Not only will it have the clearest embroidery, but it may keep your stitch count down.